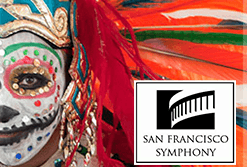 The 2014 Dia de los Muertos Family Concert with the SF Symphony at the Davies Symphony Hall in San Francisco is a day of fun and celebration for the entire family! As a longstanding member of the San Francisco League of the San Francisco Symphony, I am pleased to let you know about the 7th Annual Dia de los Muertos events. There are several ways you and your children can enjoy the festivities – We would love to see you! Tuesday, October 14, 2014 at 6pm – Private Event – Dia de los Muertos Artist Preview Tour and Reception in Davies Symphony Hall – This “Must See” private event is available to those who purchase tickets for the Dia de los Muertos Brunch & Concert prior to 10/10/14. Kids 7yo+ are welcome. Full details below. 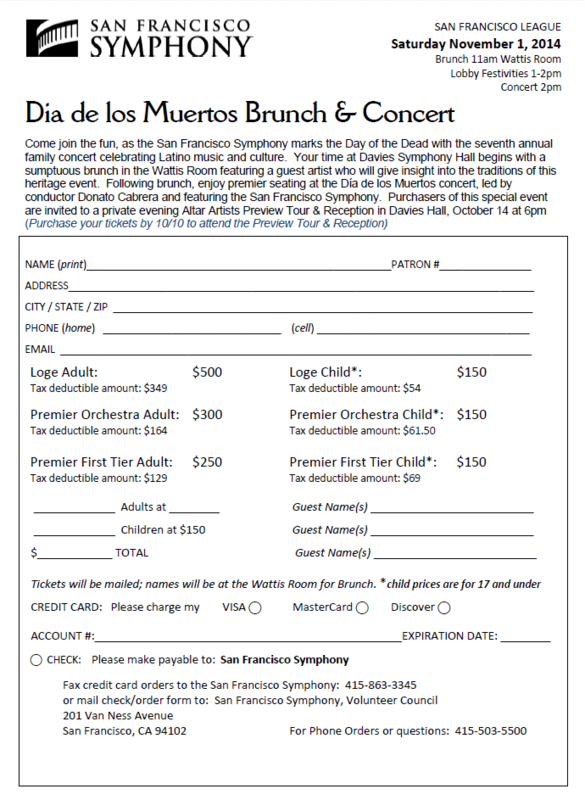 Saturday, November 1, 2014 at 11am – Special Fundraising Event by the San Francisco League of the San Francisco Symphony – Dia de los Muertos themed brunch in the Wattis Room at 11am; prior to the 2pm concert. This family-friendly brunch is a vibrant fundraising event for the San Francisco Symphony. Premier Tickets to the afternoon concert are included. In addition, an invitation to the Artist Preview Tour & Reception on Tuesday, October 14th are included when tickets to this Special Fundraising Event are purchased by 10/10/14. Full details below. Saturday, November 1, 2014 at 1pm – An hour before the Dia de los Muertos concert, the lobbies will be open for a kick-off to this afternoon of community celebration in honor of Mexican custom, music and culture. During this time, families with tickets to the Dia de los Muertos concert can enjoy the vibrant artistry of the Dia de los Muertos alters, music and activities that are all part of the pre-concert fun. Saturday, November 1, 2014 at 2pm – This lively and engaging 90min Dia de los Muertos concert has been created with families in mind. Donato Cabrera will be behind the baton and lead the San Francisco Symphony in this wonderfully expressive celebration of Mexican tradition and Latino music. There will be a 20min intermission. The hottest family ticket in town! What an exciting day at Davies Symphony Hall. It all begins with a Dia de los Muertos themed brunch in the Wattis Room, where the guest artist will share the traditions of the annual customs, including the process of creating traditional Sugar Skulls. After brunch, at 1pm, the lobbies open. Here, the celebration continues with pre-concert artistry, music and exciting, kid-friendly activities. Included in 2014 Brunch & Concert Ticket – Your Brunch/Concert ticket includes: the Dia de los Muertos Brunch at 11am, pre-concert activities at 1pm, Premier Seating at the Día de los Muertos Concert at 2pm. When you buy your tickets by 10/10/14, you also receive an invitation to a Private Event – The Altar Artists Preview Tour & Reception in Davies Hall – Tuesday, October 14th at 6pm. 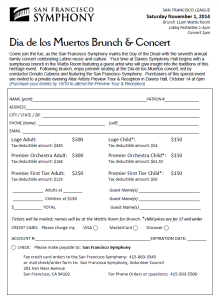 Buy Dia de los Muertos Brunch & Concert | Special Event Tickets – Special event tickets, a portion of which are considered tax deductible, may be purchased by calling the San Francisco Symphony Volunteer Council at 415-503-5500 or by faxing the Order Form below – Please scroll down. This special Preview Event is by invitation only and available to those who purchase tickets to the Special Fundraising Event: Dia de los Muertos Brunch & Concert prior to 10/10/14. This preview event supports the San Fransisco Symphony. A feast for the senses and truly a museum-caliber display of heritage art. Steeped in the tradition of the Dia de los Muertos, these colorful alters honor loved ones who have passed, and in festive celebration, invite the departed spirits home again. This explanation in words can only begin to do justice to the elaborate expression of heart, family and life. To see it, to experience it, to share in the celebration with your family, is really the only way to appreciate this exceptional display of color, artistry and tradition. An Important Note: This exclusive guided tour will visit each art installation in Davies Symphony Hall. During the tour, each artist will talk about their altar(s) and be available to answer questions. The tour will conclude in the Green Room at Davies Hall, where artists and guests can join in conversation and community during the wine reception. In order that the tour may be led in an organized way, please understand that this event starts promptly at 6pm. Kids 7yo+ are welcome. Please remember to purchase your 2014 Dia de los Muertos Concert & Brunch tickets by 10/10/14 so that you can attend this spectacular private event. Call the San Francisco Symphony Volunteer Council at 415-503-5500 or see the Order Form below – Please scroll down. Pre-concert activities begin at 1pm, followed by the Dia de los Muertos concert at 2pm. Below the video, please find all the information you need. If you have additional questions, please call the SF Symphony Box Office at (415) 864-6000. Video: From last year’s 2013 Dia de lo Muertos Festivities! Time: Come early! Doors open at 1pm for pre-concert fun. Join us as we celebrate the tradition of Dia de los Muertos and Latino music and culture in the lobbies. There will be refreshments, activities for kids and vibrant displays for all to enjoy. The concert starts at 2pm. SF Symphony Box Office: (415) 864-6000 Please call for assistance purchasing tickets or for patrons with disabilities. <<< Click photo (at left) for more details. Click ESC key to close image. Would you like to play a part in creating events like this? The San Francisco League of the San Francisco Symphony is the perfect way to do just that! Launched in 1980, the “mission of the nearly 200-member League is to provide volunteer services and financial support to the Symphony by encouraging audience development, offering educational opportunities, and increasing knowledge and ties to the Symphony.” To volunteer or learn more about the San Francisco League call (415) 503-5290 Ext 6, or email us at sfleague@sfsymphony.org. Either way, we would love to hear from you! ← Curb Appeal – Does it Matter?